Hume Auctioneers - We get the pick of the crop. Located on the Mountrath Road in this private gated development with attractive planting this 2 bedroom first floor apartment offers every convenience with all amenities within walking distance. The property is in excellent condition throughout and boasts pvc double glazed windows, electric heating, intercom phone system, and balcony to the rear looking down on to large green area. 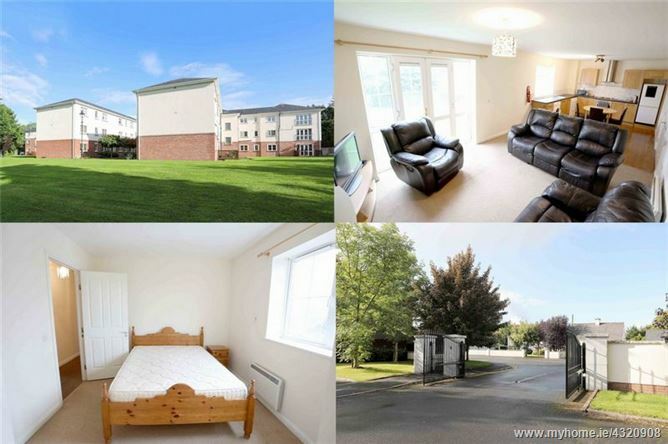 Ideally suited to first time buyers or investors. Viewing of this superb apartment is highly recommended. 6.56m x 0.90m Carpet, storage press, hot press. 8.63m x 3.47m Part lino floor covering, part carpet, feature fitted kitchen, oven, hob, tiled splash back, blind, feature electric fireplace, patio door, double doors to entrance hall with glass panels. 3.16m x 2.98m Carpet, built in wardrobe. 2.64m x 1.16m Tiled floor, part tiled walls, separate shower unit, mirror. 3.36m x 3.18m Carpet, curtains, blind, built in wardrobe, light shade. 2.19m x 1.80m Tiled floor, part tiled walls, bath, w.c., w.h.b. Take the Mountrath Road out of Portlaoise, go under the railway bridge and continue straight on, turn left into Ashbrook Gardens, down to the very end and right, property is on the right. 30 Aghnaharna Drive, Portlaoise, Co. Laois.